I cut my hair. Actually, my sister cut my hair. I had been feeling for ages, that all I did was wear my hair in a ponytail. All the time. My gray hairs were outnumbering the brown in front. And my hair was making me hot and miserable as summer came around. And as this summer comes around again, and I'm griping about my hair issues, my sweet niece Kaylee is losing her hair again. I can't do anything to take away her pain, or make it easier for her. But I can give my hair away. I hadn't donated my hair in years. I think the last time I did it was when Chris was tiny. I chopped it when Sam was young, but I don't remember if I had enough to donate or not. But for the beginning of this summer, I had a big fat ponytail. Whenever I wore it down, people would comment on how long it was. Because they never saw it down. I was getting stuck sitting against it, rolling over on it in the middle of the night. I wanted at the very least a trim. But I saw some of my friends had gorgeous short hair, and it looked so easy to take care of in the summer. It was time. Time to get rid of it. So, since my sister was over for the weekend, she and I started looking at pictures/ideas of short hairstyles that might work for me. I was thinking something like Milla Jovovich but Lisa said, I don't have an army of hair stylists, so we need something easy to take care of...without an army of hair handlers. So then I thought about other cute short hairstyles. And then This One came to mind. So we thought that might be something in the middle. Step 1 - the Rapunzel. Time to cut the giant ponytail. It ended up being 10 inches long from end to end, but the ends are kind of meh, so they'll probably only be able to use about 8 good inches. Still, Lisa says I have enough hair to make an entire wig myself. It's easy to not get scared of a drastic haircut when I can remember it's just going to grow back. That is not the case with some of the recipients. I send my hair with all prayers for their good health. I hope my hair can just cover them through a phase, and that most importantly, they heal and don't need it anymore. So this was the final product. 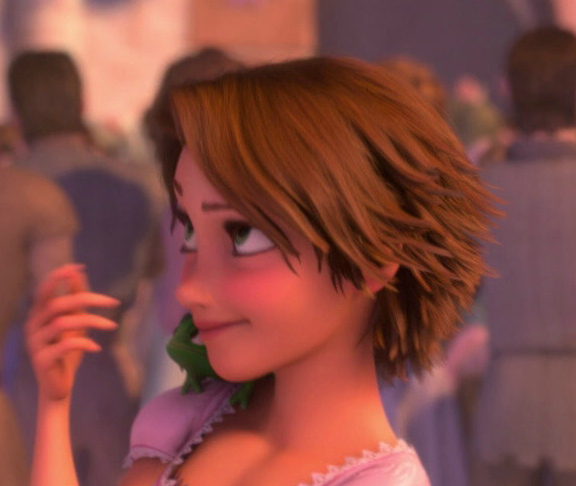 Not exactly Milla, not exactly Rapunzel, but definitely what I wanted. Short hair.